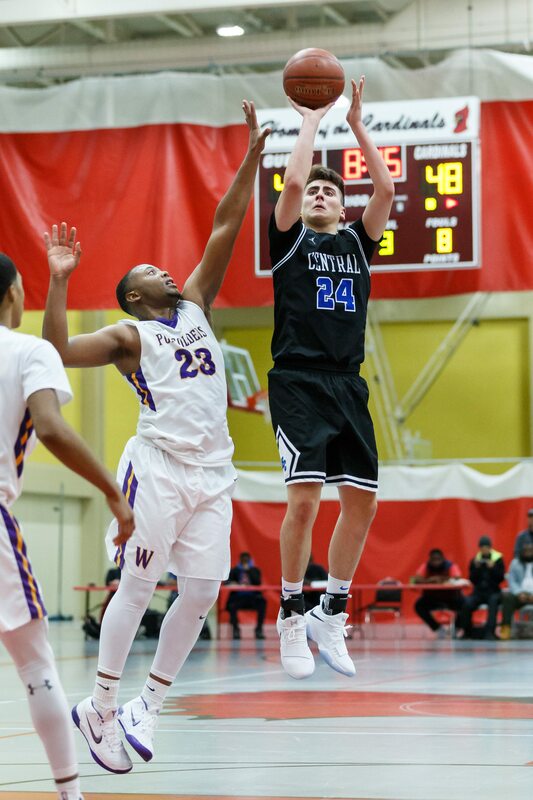 If the Brookfield Central boys basketball team hopes to defend their Greater Metro Conference Championship and make a return trip to the state tournament in Madison, a lot will depend on the Lancers top returning senior - Andres Peralta-Werns. 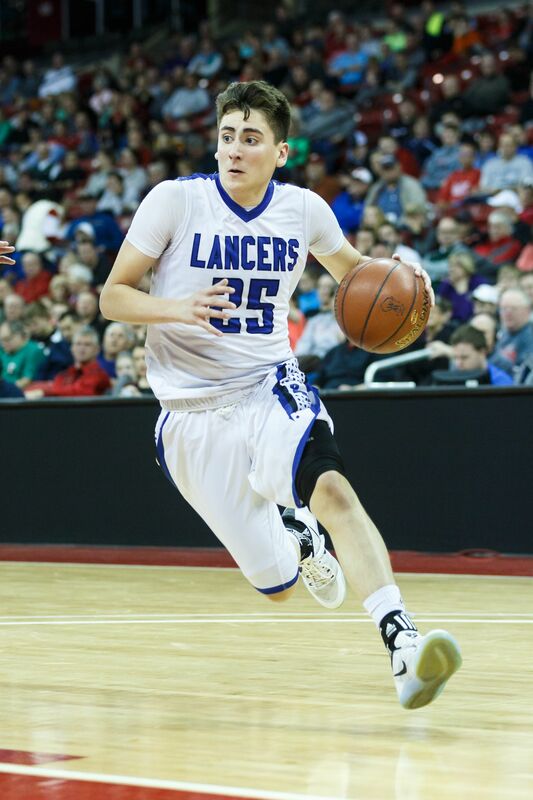 When people who aren't close to the program think of the Lancers, they think of two juniors - point guard Gage Malensek or forward and defensive stopper Cole Nau. But the play and the enthusiasm of Peralta-Werns will play a key role in the Lancers success. The 6-foot-3 inch, 190 pound swing man (guard/forward) averaged 16.7 points per game in the early going, shooting .455 from the field and .333 from 3-point range. He was second on the team last season, averaging 15 points per game and was third in rebounds (3.7). Where as Peralta-Werns is known for his long-range shooting, he can put the ball on the floor and drive to the hoop and improved his defense as well, putting together a well-rounded game. Brookfield Central coach Dan Wandrey saw good things from Andres early in his career. "I always thought he had a lot of ability, especially offensively," Wandrey said. "His sophomore year when he played with us on the varsity, he had a handful of explosive games. Really, what I was most impressed with with Andres was from his sophomore until his junior year he really focused in on what we asked him to do. Photo by Alan Herzberg , SportsPhotoLLC --- Senior Andres Peralta-Werns has improved his game the last three seasons, adding defense and taking the ball to the basket to his long-range shooting arsenal. "He's a better defender, a better rebounder, he has a better shot selection and he takes better care of the ball. You saw the improvement he made last year averaging 15 points a game, his most impressive year as he had some of his best games. He's been really good that way." Andres considers that one of his strong points. "One of my main strengths is I'm very coachable and I'm good at adapting to what people want me to do," he said. "People don't really know this, but I spend - right now as a senior - I spend 2-3 hours a day with my dad (Glen) playing basketball. "He is a really good coach. He is one of these people I can't correct because he's right about what he says. When people tell me something I have a mindset of what they want now in a basketball perspective. I can comprehend what they're saying." Ironically, Wandrey first became aware of Peralta-Werns because of his sister, Alejandra, who played for him when he was the girls coach. "His sister played in the girls program when I was coaching there, so I knew him from middle school," Wandrey recalled. "When I accepted the boys position, he was in eighth grade. I had the opportunity to watch him play a little bit then. He made our JV team right away as a freshman. I knew who he was because of the family connection. Obviously it's not on your radar when you're coaching girls." Andres started playing in the fifth grade with the Jr. Lancers. He only made the 'B' team, so he went out for club basketball. He played with the Ballers, a Menomonee Falls team, until early ninth grade. He played on a 17U team when he was only in eighth grade. "I wanted to try and get better and make the 'A' team eventually. I played in the summer and a couple times played in the fall before basketball season. It was a really good way for me to work on my abilities. I wanted to get the experience and stuff, get better, scoring, running up and down the court. When I got into high school, playing club was more for recruiting purposes. Everyone wants to see you play AAU and also wants to see you play high school." Wandrey was very complimentary about Peralta-Werns' skills and compared him to a former GMC Player of the Year. "He has an uncanny knack for being able to score. In some ways he reminds me of Andrew Bruggink who played for us a few year's ago," Wandrey said. "They kind of came to us as shooters - Andres was a really good 3-point shooter, a really good long-range shooter. "As people started taking that away, he improved the other parts of his game. Is he a finished product? Of course he's not; he's only a senior in high school. You look at the way he's played this year and what I've seen in the off-season in the summer. He can finish getting to the rim and he has a nice mid-range game." Peralta-Werns is always look to improve and he talked about what he needs to work on. "Two things I want to get better at are athleticism and defense," he said. "Everyone loves to score. That's something that everybody in this generation picks up. They can shoot the ball or dribble the ball or make good passes. But a lot of people forget about the defensive side of it. I'm not the most athletic guy so any time we play a team I always try to get up there and compete at the level they've at." Wandrey see an important area Andres can help the Lancers with. "I think an important key for us with him is to be a better rebounder," he said. "When I say better, what I mean most is consistent, because he shows he can do it. We just need him to do it a little bit more regularly. He's gotten a little bigger, a little stronger and I think that helps him in those areas too. His ability to go to the basket - that's something he really improved on." Photo by Alan Herzberg, SportsPhotosLLC --- When you think of Andres Peralta-Werns, you think of his impressive long-range shot. Wandrey then had an interesting theory, comparing Andres to a good golfer. "Just offensively, having that knack to score. He has a great short memory, but not in a bad way. Good scorers and shooters like good putters have short memories," Wandrey said. "I play golf. If I miss a 3-foot put on the second hole, I don't want that hanging around me for the next 15. Andres has it. The game over at Tosa East last year sticks in my mind. He shot a very poor percentage, but late in the game, we're down by one or two points and he takes the ball to the rim and makes a basket and then makes a 3-pointer after going like 3-for-15. He makes that basket and it's one of the most important baskets of the game. "In a good way that short memory - 'I'm not going to let it get to me' - is a good thing too." Andres then spoke about something that is important to him - leadership. "It's a thing that everyone should have, everyone should take ownership on what they should do," he said. "Overall perception is everyone's part of the team, so no one can blame others. "I like working with young players. My dad told me respect the people that are older than you and respect people who are younger. When they're older, they're going to remember you (and how you treated them). When they look up to you, they want to say I want to be just like him. You don't want them to have any negative view on you and they also don't want to pick up any negative habits." Wandrey feels Andres is on the right path. "What I like about Andres is he is a very pleasant person, just a great kid," he said. "I wasn't sure how to take him when he was a freshman. He was always 'Thank you coach, Yes coach.' As I watched him, he's been on the team now where we've had a couple freshman when he was a sophomore - we have a couple freshman now when he's a senior. I think this is a great form of leadership - he treats those guys well. He wants them to be successful. He wants them to be an important part of our team. He looks for ways to help them and make them feel comfortable and I think that's really important. Andres’ personality is another way he influences the Lancers. "In some fun quirky ways at the end of practice, Andres is the guy who 'claps it up,' gets everybody fired up. He's got that vivacious personality of being up and keeping the crowd up with him." MOST MEMORABLE MOMENT: ​Fans reaction when team came out before game in sectional final.